Apple's Touch ID: genuinely useful or passing gimmick? Seconds after Apple's 2013 iPhone event ended the inevitable chorus of doom-mongering began. High-velocity complaints and entitlement missiles were fired at millions of eyes, with payloads of "no surprises *sadface*" and "Apple didn't add NFC/a six-inch display/my random tech fantasy hardly anyone else cares about" (delete as applicable). Instead, they bellowed, all we got was a blingphone with a fingerprint sensor! Imagine! Leaving aside Apple's newfound infatuation with 'gold' (which could be a smart move in upping the iPhone's appeal in the likes of China and India), idly waving away the fingerprint sensor as a trifling distraction is the preserve of someone who doesn't get Apple, how the company approaches technology, and also how typical consumers approach digital security. Horror stories abound regarding passwords, with security companies regularly revealing the top-spot goes to 'password', the runner-up often being the imaginative '12345678'. Apple forces a more complex mix of characters for your Apple ID password, but you can be sure most people use the simplest, easiest-to-remember combinations. Additionally, although anyone can set a four-digit passcode to block unwanted access to an iOS device, not everyone does. Constantly tapping it in when unlocking a device is deemed a hassle - people have enough codes to remember in their lives without adding another. A fingerprint makes authorisation interactions almost invisible. Apple's Touch ID system therefore showcases the company's focus on user experience over technological fads, and that it cares more about systems that will get immediate widespread adoption than merely being 'cutting edge' in some manner that might make a select group of techies excited. With a little thought, it's easy to see why Apple would prioritise Touch ID over the likes of, say, NFC. The latter is gaining ground but remains somewhat niche, whereas the former can make every iPhone 5S more secure, with very little effort on the part of the user. Beyond merely unlocking an iPhone 5s or buying apps more rapidly, Apple also talks about enrolling multiple fingerprints, to cater for "the people you trust". Extrapolate logically into the near future, and the sensor won't be solely an iPhone 5s thing, but present across Apple's entire line. Combined with the iCloud Keychain, this could bring a mightily powerful usable personal security layer to Apple's entire range. There are, of course, obvious questions relating to Touch ID technology. Beyond whether it'll actually work in the wild (you can almost hear the 'fingerprintgate' engine revving up), there are security and privacy implications. Apple states the data is stored in encrypted fashion on the A7 chip and is never sent to iCloud. Also, as explained in depth by Rich Mogull on TidBITs, the system Apple uses "can't be faked out with a photocopy of a fingerprint". It also, says Mogull, in reality stores a 'template' of your fingerprint; this means a stolen or hacked device contains an abstraction of your most important identifier, not a direct copy of the real thing. In a post-Snowden world, though, people are very wary of large corporations and any promises they make regarding private data. On Twitter, author and technologist Suw Charman-Anderson remarked: "You only have one set of fingerprints. You have to look after them." 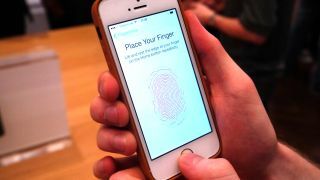 Similar sentiments have been expressed quite widely by people concerned about 'giving up' their fingerprints to the Cupertino machine, or even the broader normalisation of fingerprint ID should Apple itself be entirely above board. But this still ignores the context surrounding user experience, personal security and human nature. Give someone a reliable fingerprint sensor and they'll likely use it and possibly even enjoy it. "It's just like Star Trek!" Task them with defining complex passwords and activating pass codes and they'll probably get bored, confused, or just have another game of Angry Birds, leaving their devices, data and accounts less secure.